Hero cop: He got killed. Honor student: Dead kid registered for classes somewhere. Exclusive neighborhood/school/club: the reporter can't get in. Allegedly: He did it but we can't prove it. Shocking revelation: leaked on a slow news day. Couldn't be reached for comment: the reporter didn't call until after 5 p.m. Modest, well-kept home: at least the cockroaches are dead. Conflagration: what was a fire in the first paragraph, a blaze in the second and an inferno in the third. Effervescent: She won't shut up. Socialite: woman without job who lives between 57th and 86th street, west of Lex and east of Fifth. Heiress: see above, but able to hire a pricey divorce lawyer. Entrepreneur: Hasn't made it yet, but we're doing a nice story about him. Mogul: Has made it, and we're doing a hatchet job. Mega-mogul: Has made it, and is in process of losing it. Dapper: Hasn't bought new clothes in 20 years. Yesterday was not a good day. A family friend passed on, CBS cancelled Joan of Arcadia, Frank Gorshin died and my laptop's display and hard drive zonked out. The laptop business puts a major crimp in my lifestyle, since it's more or less the center of my day-to-day existence. Toshiba says it'll take seven to ten business days to do the warranty repairs- a veritable eternity. Fortunately, I have copies of the most vital stuff on my Palm Pilot and PlanerPad, and Connected Online Backup will be able to restore the laptop's data files in just a couple of hours, once it's back from the shop. But it'll take a week to jiggle things to the point where I'm comfortable again. I have no proof of this, but strictly on an anecdotal basis, it seem laptops are becoming less reliable. The laptop I acquired in 1999 lasted for four years. 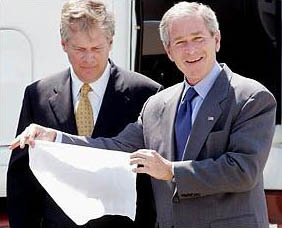 The second functioned for about 15 months before crapping out. The current one expired in less than six months. Co-workers seem to have the same experience, regardless of manufacturer or brand. On the plus side, I now have no excuse for not reading the biographies of Ben Franklin and Alexander Hamilton. And maybe I'll buy an actual newspaper to peruse on the train. "Damn. He made my Social Security disappear." US Airways and America West merging... why, it rivals the audience anticipation and potential success of a Pauly Shore/Rob Schneider movie. Chicago mayor Richard Daley, in response to the threat of terrorism, wants to ban all light plane traffic over Chicago. Daley's no stranger to terrorism. His midnight destruction of Meigs Field with federal money earmarked for airport improvements is probably the most daring act of wanton lawlessness ever accomplished by a municipal official in modern times. 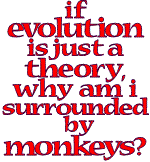 There's just one problem. Light planes, like the little Cessna 150 that buzzed DC last week, just aren't a threat. They're pitifully light; the 150 only weighs 1,100 pounds empty, about 1/7 the weight of an SUV. The payload capability is laughable. With two pilots and a full load of fuel, a 150 is lucky to get off the ground, let alone transform itself into a weapon of mass destruction. What happens when a light plane hits a building? As this shows, the building suffers some broken glass and damaged furniture, and the aircraft is quickly converted into modern art. I wish the government would quit worrying about light planes, disposable lighters and grandmas with knitting needles and do something constructive. The appearance of security is not security; often, like last week's evacuation in D.C., it's just an embarrassment. There are now over 12,000 quotations in the KGB Quotations Database. Eff the Ineffable isn't going to be updated for a while, though... I want to completely revamp the book, and the amount of time required for that effort precludes anything happening in the next year or so. 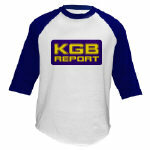 Commentwear by KGB is now open, and the right column of the KGB Report features the latest items available there.